Hurt, angry, frustrated, or scared? We are a phone call or e-mail away to help answer your questions, ease your fears, and to calm your nerves. We won't charge a dime for our initial consultation. If you have been injured in an accident, you need an experienced jefferson city personal injury lawyer to fight for you. At Call & Gentry Law Group, we represent people in many types of personal injury cases. Our team will fight hard to get you the compensation you deserve. Schedule a free initial consultation at our Jefferson City law office today by calling 573-644-6090 or by emailing us at contact@callgentry.com. If someone you love has been hurt, or even killed in an accident, you may be entitled to damages and compensation for wrongful death and the loss of monetary support and services of your loved one. We can help you deal with the legal and financial problems that come with a serious personal injury. Call & Gentry Law Group can help you pursue a solution that is right for you. Dealing with insurance companies is a large part of helping people who have been injured in an accident. Our experience dealing with insurance companies in all types of litigation and in personal injury law allows us to work efficiently to determine the full extent of your injuries and pursue the money you need to properly compensate you. We may use life-care planners, economists, rehabilitation experts and accident reconstruction professionals to prepare a detailed picture of your injury, your monetary and emotional losses and what you can expect in the future. We handle cases involving the bad faith denial of an insurance claim and can make insurance companies pay when they refuse to honor their contract obligations. Wherever your case leads, you can count on Call & Gentry Law Group to give you honest, accurate and straightforward advice. Our attorneys at Call & Gentry Law Group have been representing personal injury victims and their families for years. 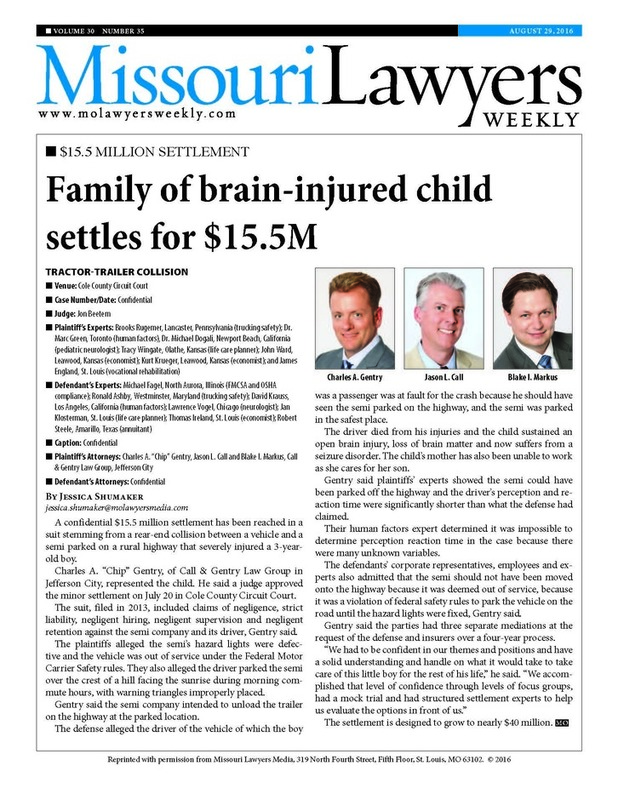 Attorneys Jason Call, Chip Gentry, Emily Fretwell and Nick Leslie collectively have more than 50 years of experience handling personal injury claims and lawsuits. Our team of skilled attorneys along with our experienced and exceptional staff can provide unparalleled service and personal attention to your case. Please feel free to drop by the office, email us at contact@callgentry.com or call us at 573-644-6090 for a free consultation.